Design Consultant Janel Campbell (center) leads tour attendees through a remodeling project. Heidi Hawk and Matt Sipes admire Campbell’s work. PORTLAND, OR. 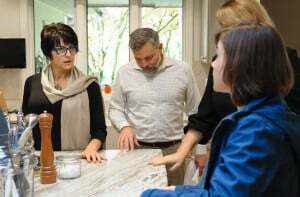 — A selection of recent residential remodeling projects were showcased on Neil Kelly’s Fall In-Home Job Tour on Friday, October 21. 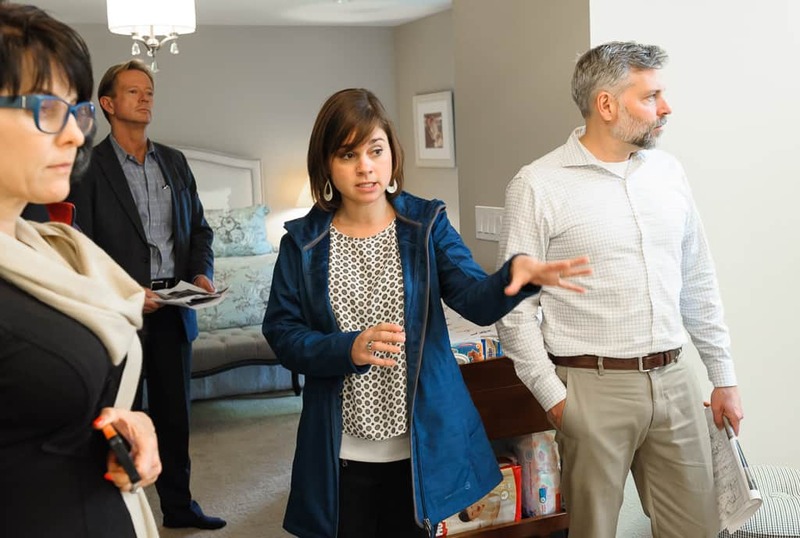 Design-Builder Byron Kellar, and Design Consultant Janel Campbell were on hand to lead Neil Kelly staff and guests through each location, showing off the scope of the projects, pointing out key design features, and discussing challenges that were overcome along the way. Byron Kellar presented two projects on the tour. The first, a kitchen in Southwest Portland, had been difficult to access via the existing entryway, and too small for the homeowner to work and entertain guests comfortably. “The best part of this thing was the bang for the buck. A few subtle changes added tremendous value to the home,” Kellar said. “Surgical” was the word Janel Campbell used to describe the changes that were made to her client’s home in Tigard. In the kitchen, Campbell and her team were able to extend the space with a wet bar and display cabinetry, reduce the size of the microwave cabinet to create additional storage, remove an island drawer cabinet to allow for more seating, and change the primary kitchen sink to a farmhouse sink, among other things. In the master suite, the team replaced a large deck mounted tub with a free standing tub, installed a curbless shower, and swapped out one vanity to improve a mismatched set. Throughout the house, oppressive wall-to-wall carpeting and floral wallpaper that had been installed by a previous homeowner was removed to give the home a more soothing, open feel. Campbell said her favorite part of the project was working with the clients. “They are absolutely lovely people and everyone enjoyed working with them,” she said.